VAN BUREN, Martin (1782-1862) was an American statesman who served as the eighth President of the United States from 1837 to 1841 and a founder of the Democratic Party. He served as the ninth Governor of New York, the tenth U.S. Secretary of State, and the eighth Vice President of the United States. He won the 1836 presidential election because of the endorsement of popular outgoing President Andrew Jackson and the organizational strength of the Democratic Party. He lost his 1840 re-election bid to Whig Party nominee William Henry Harrison due in part to the poor economic conditions of the Panic of 1837. Later in his life, Van Buren emerged as an important anti-slavery leader and led the Free Soil Party ticket in the 1848 presidential election. 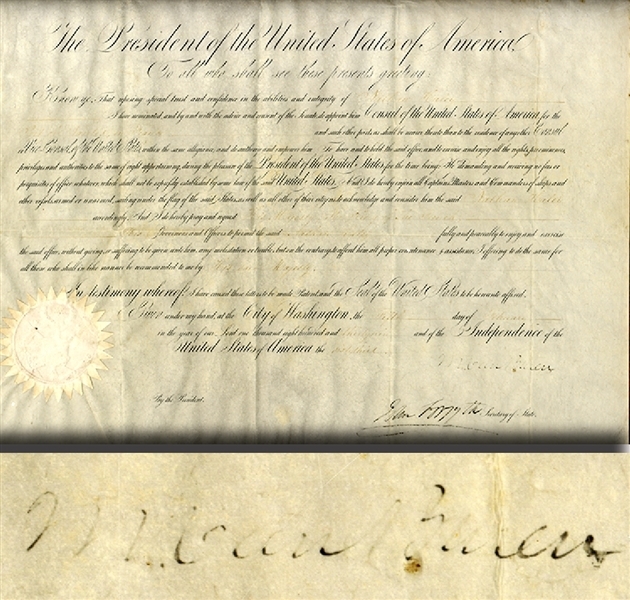 Framed Document Signed, 17-1/2 x 12-1/2”, as President, “M Van Buren” and counter signed by “John Forsyth” as Secretary of State. This is an appointment as Consul of the United States of America. Unfortunately the ink has faded to the point that it is not readable. The Van Buren signature is a “skipped signature” about 40% present.